Upgrade of Automotive manufacturing building, plant and equipment, including ventilation system. Construction of 90m2 covered walkway to international seismic codes. Level measurement for Class 3 storage, Architectural and Structural detailing of main Production Plants. 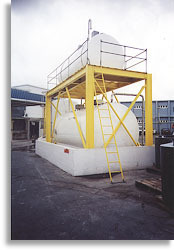 Solvent and Waterbase plant upgrades including Fume and dust extraction. Upgrade on oil fluid blending facilities, oil packaging and fume extraction systems. Development of site waste management procedures and equipment for wharf systems. Development of Operating procedures and technical documentation for new technological developments for the Oil Industry and Armed forces. Manufacture of methanol based fuel derivative. Implementation of Hazardous Storage facilities, Waste Management and Site Management of Industrial Wastes including Class 3A Dangerous Goods. Manufacture of formaldehyde from methanol in a continuously controlled processes Implementation of Resin and Waste treatment facilities. Design of wax based emulsions facility. Batch Mixing/Cooling/dilution plant utilising Caustic Soda based products and also Cooling Products. Development of advanced Computer Aided design facility between New Zealand and Australia. Detergent plant and packaging facility. 1.5 million litre class 3A storage facilites.